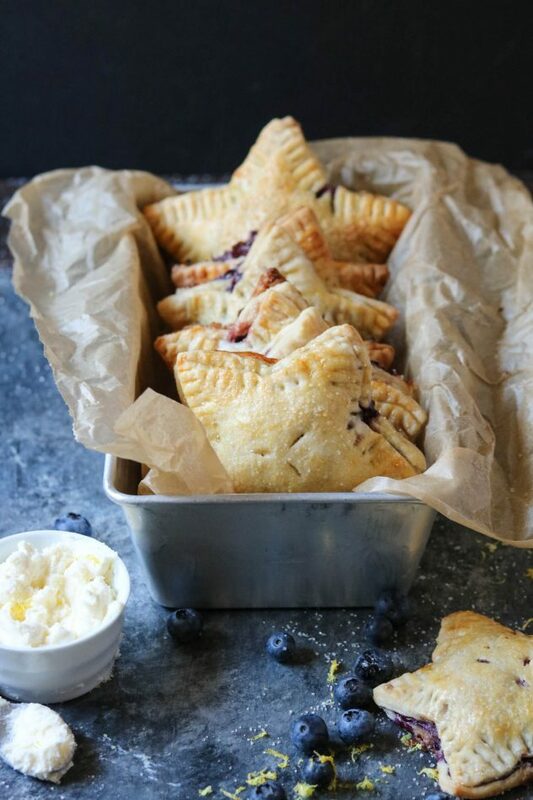 Have you ever tried making your own hand pies? 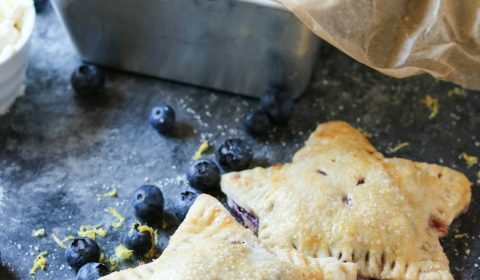 These lemon blueberry marscapone hand pies were so fun to make! As a kid, I remember buying those individual fruit hand pies from Hostess and loving them, but I was never a fan of the pie filling they used on the inside. I wanted to create a fresher option, capitalizing on fresh berries while we’re in berry season. I decided to also use a star cookie cutter for these so you’d have THE perfect dessert for your upcoming 4th of July party! My star cookie cutter I use at Christmas time wasn’t quite big enough, so I picked up this Wilton Set of 6 Nesting Star Cutters an Amazon for under $5.00!! This set had the star shape I was looking for and had large options, perfect for hand pies. With all of my pie crusts, I always have a gluten-free option. That’s why I love using Cup4Cup’s Gluten-free flour blend . You’ve heard me say it before, but this is the best one-to-one gluten-free flour blend I’ve found for baking. 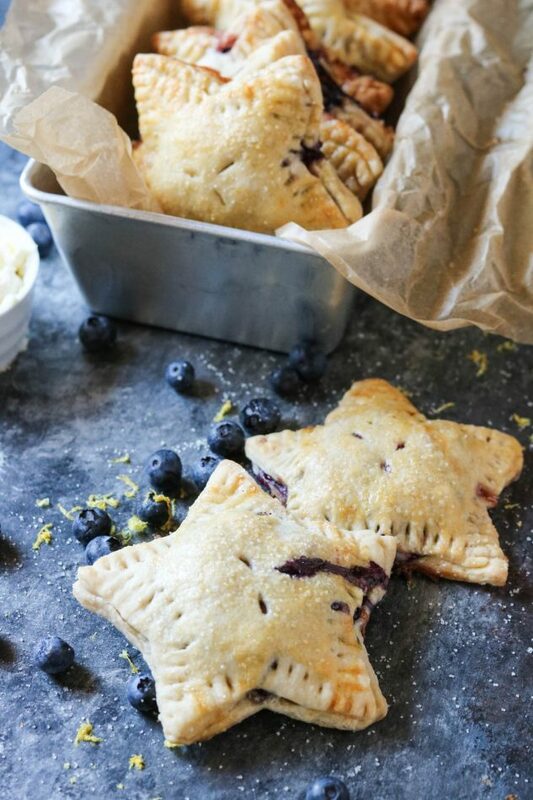 These lemon blueberry marscapone hand pies are no exception, simply swap out the all-purpose flour for Cup4Cup’s Gluten-free flour blend and you now have gluten-free hand pies! Let’s talk about marscapone cheese. Have you ever cooked with it? I’ve tried it in other desserts, and have seen it used several times on the various cooking shows I watch, but had never used it personally in any dessert. Marscapone is an Italian cream cheese, which is made by curdling milk cream with citric or acetic acid. It’s sweeter than traditional cream cheese and lighter in consistency. Marscapone is used in tiramisu and often times cheesecakes and even in frosting recipes. I wanted to add a creamy element to these hand pies so I decided to use marscapone cheese. It was perfect! 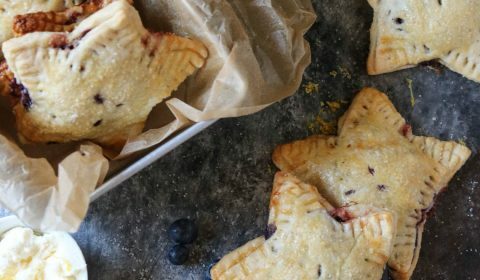 Fix these lemon blueberry marscapone hand pies for your upcoming 4th of July party and be sure to share on social media with the hashtag #wanderlustandwellness! 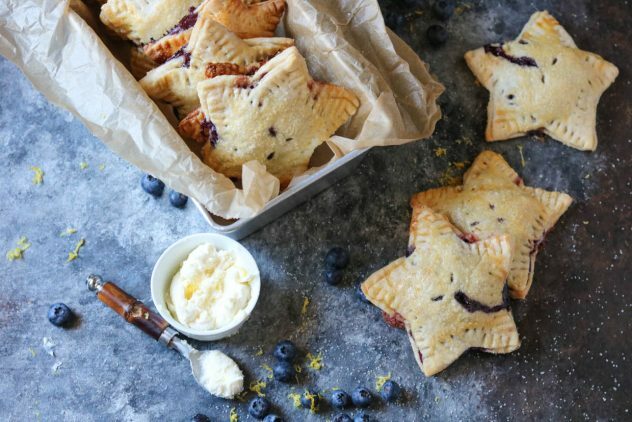 Lemon Blueberry Marscapone hand pies are the perfect summer treat. 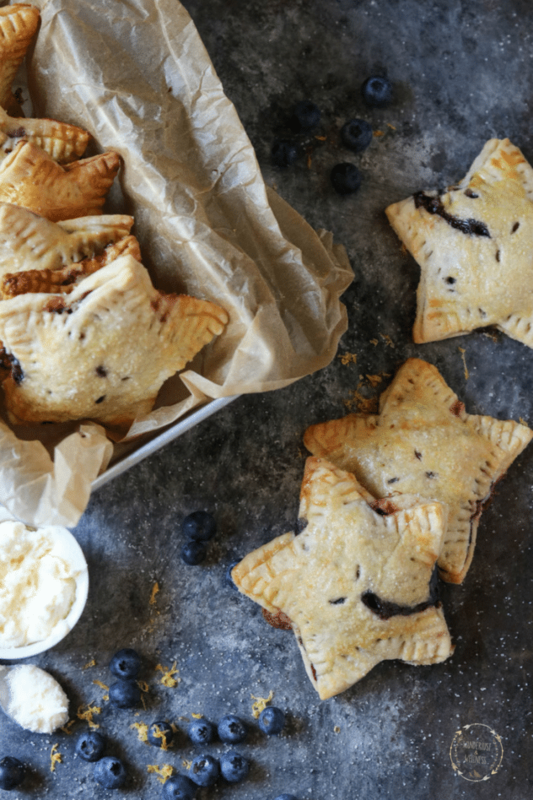 The star shape of these hand pies also makes them perfect for 4th of July! Press the dough into a ball or disc, wrap and refrigerate for 20 minutes. While dough is chilling, combine the berry filling ingredients and place into the refrigerator to chill. When the dough is ready, lay out one sheet of parchment paper and flour lightly. Add dough to floured surface. Then cover the dough with an additional sheet of parchment paper and roll out into a large 12-14 inch circle. You can also just roll with a floured rolling pin, whichever you prefer. You’ll want the dough to be fairly thin, at least 1/8″ or thinner. Using the cookie cutter, cut out as many stars as you can fit and transfer them to a baking sheet lined with parchment paper. Continue to re-roll your dough and cut out starts until all dough is used up. To assemble your stars, add 1 1/2 tbsp of marscapone cheese to the center of the star. Top with 2 tbsp of berry filling. Gently place another star on top of the filling and seal the edges with your fingers. Then, press the tines of a fork around the entire edge of the star to fully seal the hand pie. Repeat this process for all of the stars. Once all of the hand pies are assembled, use a knife to cut 3 small slits into the top crust. Then, in a small bowl, whisk the one egg and brush over each of the stars. Sprinkle additional sugar over each star, then place in the oven to bake. Bake for 30 minutes, then remove from oven and let cool before serving.